“Treat yo self.” This line has been the defining meme of our generation ever since “Parks and Rec” aired the episode. In this society of egocentric civilians, it’s every person for themselves—which is unsurprising when you hear that the growing trend this holiday season is called self-gifting. Yeah. You heard me correctly: self-gifting. It’s like getting a gift for a friend but it’s really for you. What a strange concept. Six years ago on Black Friday, Marshal Cohen, a retail analyst at NPD Group, began tracking the trend. According to Cohen, 30 percent of Thanksgiving holiday pur†chases are for self-gifting. There are many reasons why self-gifting has become more popular over the years. First, holiday ads not only include giving gifts to your loved ones, but also to yourself. Also, since we do gift shopping for other people, we know when the sales are, and which stores have the most discounts. Therefore, we can discern what the best bargain is (especially for self-indulgence). Everybody is doing it, apparently. I take it more as when Lucy from “I Love Lucy” worked at the chocolate factory. She left some for other people, but also made sure she had enough chocolate for herself. But should we praise and commend self-gifting, or is it too self-indulgent to be socially acceptable? I guess it depends on the person. Most people in our society think that everyone deserves a good treat sometimes, especially ourselves. Also, our generation tends to be mentally vulnerable, says TIME. We all indulge in retail therapy in one way or another, don’t deny it. I think it’s more that we, as a whole, love ourselves (or pretend to). And with that image comes, of course, material goods. You can’t tell me that you haven’t bargained with yourself in some way. If I just finish this chapter in my textbook, I’ll let myself watch an episode of my favorite show on Netflix. It’s not a problem. In fact, it keeps business up. I’m not much for clothing therapy, or homely items, but I find myself indulging in food-related expenses and concert tickets. To each their own. So, make sure to treat yo self this holiday season because you’ve earned it. Happy holidays! Beverly – Thanks for commenting. I agree with you about not neneidg something new to enjoy the holidays. My parents are in their late 70s and they still fall victim to the feeling that need to buy everyone several gifts. I know it’s because they love us, but I wish they could see that it’s not necessary to buy so much in order for us to feel their love. 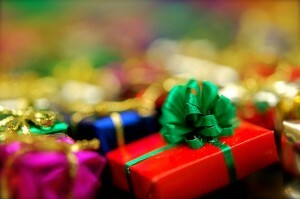 I think we become conditioned to the gift-giving aspect of the holidays over our entire lives. It’s hard to break free, but it feels so good to do so.